Did you know that the combined sufferings of Jesus on the cross produced the most brutal crucifixion ever experienced? 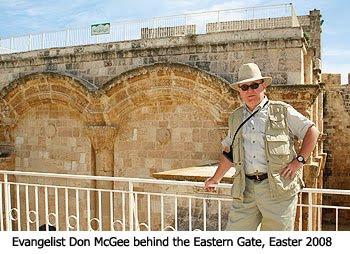 Don McGee: We have arrived at Psalm 22:11 — the great prophetic psalm about the Messiah on the Cross. This is where the psalmist returns to the Messiah's emotional suffering. He writes, "Be not far from me, for trouble is near; for there is none to help." Dr. Reagan: This is a prophecy concerning the solitude the Messiah would experience in His passion. This verse says He will suffer emotionally from His desertion by all His disciples. The fulfillment of this prophecy is recorded over in Matthew 26 where it says, "While He [Jesus] was still speaking, behold, Judas, one of the twelve, came up accompanied by a large crowd with swords and clubs. Immediately Judas went to Jesus and said, 'Hail, Rabbi!' and kissed Him. And Jesus said to him, 'Friend, do what you have come for.' Then they came and laid hands on Jesus and seized Him. Then all the disciples left Him and fled." Don McGee: At Psalm 22:12 the focus shifts back to the Messiah's spiritual suffering. The psalmist resorts to symbolic language to describe a spiritual attack the Messiah will experience during his passion. Verse 12 reads, "Many bulls have surrounded me; strong bulls of Bashan have encircled me. They open wide their mouth at me, as a ravening and a roaring lion." I believe this is a prophecy that the Messiah in His passion would be surrounded by demonic hordes gloating over his approaching death. In the New Testament, in First Peter 5:8, Peter describes Satan as "a roaring lion seeking someone to devour." Dr. Reagan: Although there is no recorded fulfillment of this prophecy in the New Testament, I have absolutely no doubt that it happened. The people who were witnesses of the crucifixion could not see the demons with their physical eyes. But Jesus, with His spiritual eyes could undoubtedly see them as they danced around the Cross and gloated over their "victory" in orchestrating the murder of God's Son. Don McGee: At Psalm 22:14 the psalmist begins to describe the Messiah's physical suffering in gory detail. He writes, beginning with verse 14, "I am poured out like water, and all my bones are out of joint; My heart is like wax; it is melted within me. My strength is dried up like a potsherd, and my tongue cleaves to my jaws; and You lay me in the dust of death." His bones are out of joint. He is suffering from extreme thirst. His heart is stressed to the point of bursting. Death just hovers about Him. In fulfillment, here's how the Gospel of Mark describes the suffering of Jesus, beginning with verse 15 there: "after having Jesus scourged, he [that is Pilate] delivered Him to be crucified. And the soldiers took Him away, they dressed Him up in purple, and after twisting a crown of thorns, they put it on Him. They kept beating His head with a reed, and spitting on Him." Don McGee: When we come to Psalm 22:16 we encounter one of the most remarkable prophecies in the Hebrew Scriptures, "For dogs have surrounded me; a band of evildoers has encompassed me; they pierced my hands and feet." Keep in mind that these words were written 1,000 years before the birth of Jesus. This means that they were also written 700 years before the Romans refined crucifixion as a method of execution. Yet, by inspiration of the Holy Spirit, David prophesied that the Messiah would die by having His hands and feet pierced! Dr. Reagan: Also keep in mind that the Jewish method of execution at the time that David wrote the psalm was by stoning. This was still true one thousand years later when Jesus lived. But, the Jews had lost the power of implementing capital punishment under Roman rule and so they turned Jesus over to the Roman authorities when they decided that He should be executed. All four of the gospel stories record the execution of Jesus by crucifixion. The Gospel of Mark describes it succinctly as follows. Mark writes, "Then they brought Him to the place Golgotha, which is translated, Place of a Skull. And they crucified Him." Don McGee: The prophet concludes his observations about the suffering of the Messiah in Psalm 22:17-18, "I can count all my bones. They look, they stare at me; they divide my garments among them, and for my clothing they cast lots." All the Messiah's rib bones are laid bare as He gasps for air while hanging on the execution stake. And the emotional suffering continues as no one shows any compassion. Instead, while His life ebbs away, those carrying out the cruelty pass the time by gambling for His clothing. Matthew describes the fulfillment of this prophecy in this manner, "And when they had crucified Him, they divided up His garments among themselves by casting lots." In the next part of this series on the Passion in Bible Prophecy, we'll witness the prophetic fulfillment of deliverance and victory for Jesus from the cross. doesnt this psalm even predict the words that come from the priests mouth? also, a side note, i have always felt bad for pilate. he was in a very tuff spot. he wanted to release jesus. its very unfortunate he went down in history as the one who crucified jesus. i think he got the short end of it. (besides jesus of course) i feel bad for pilate. When I saw the Pilate Stone at Caesarea Maritima that has Pilate's name on it I couldn't help but laugh when reading the plaque next to it. The sheer irony that the stone was once used as part of an ancient urinal. People daily paid their "respects" to Pilate! O how they must have loved Pilate to give so freely of themselves. How would you say, "If you should sprinkle, when you tinkle, please be sweet and wipe the seat" in Latin? Pleasacus beesweeticus and wipus the seaticus. ad infinitum! I actually tried to figure it out, but it seems there's no Latin word for "tinkle". "I was thinking "y fronts" were suspenders. Hmm, how did we get from the timing of the Rapture to talking about underwear?!?" "rg said... EI, a loo in the driveway would have been very handy as an extra in case the other one was occupied." With a vacant stare and flushed cheeks, E.I's face looked strained as she sat meditating on the latest motion passed by DrNofog. "It does appear we be a mite pre-occupied with the nether regions of late" she grunted to herself. Purely for historical interest, its a fact that in Gloucester Cathedral, in the area where Harry Potter was filmed, are the ancient stones of the Lavatorium where the monks attempted to clean up their dirty habits.